The Melbourne Vixens will head to Bendigo on the weekend of 30-31 March for a pre-season competition in the lead-up to the 2019 Suncorp Super Netball season. The round-robin format will see the Vixens host three teams at Bendigo Stadium with the support of the City of Greater Bendigo and the Victorian Government. Melbourne Vixens head coach, Simone McKinnis said the pre-season matches provide a great opportunity for the team to finalise preparations ahead of the season and give back to the community. “Getting to play in a pre-season competition like this is an important part of pre-season as it’s an opportunity for us to uncover areas of our games to focus on in the final few weeks before round one,” McKinnis said. Netball Victoria will also be engaged in a number of community events in the area in the week of the competition, including a coaches conference, umpiring workshops, Rock Up Netball sessions and junior clinics. 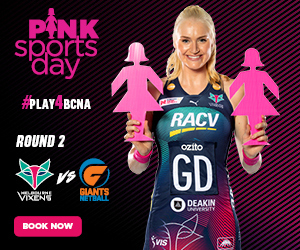 Netball Victoria would like to acknowledge the Victorian Government and City of Greater Bendigo's support of this event. Minister for Sport John Eren said “The Andrews Government is proud to bring the best netballers to Bendigo in March. It gives us an opportunity to showcase our wonderful facilities and add to the long list of events we have secured for regional Victoria." City of Greater Bendigo Tourism and Major Events Manager Terry Karamaloudis said the recently expanded Bendigo Stadium was well equipped to host competitions of this standard. “The stadium has recently hosted Melbourne United and the Australian Men’s Basketball Team which demonstrates the level of sporting events Bendigo is attracting. Further details including teams attending will be announced closer to the date.